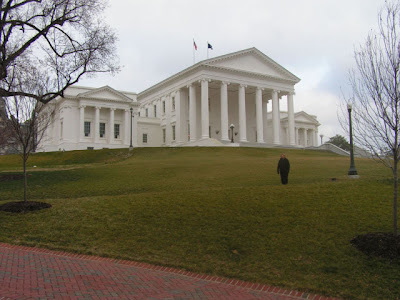 We headed south toward after photographing the Virginia Capitol on Saturday night. 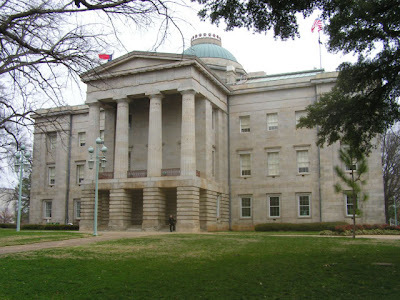 But we had one more capitol to pick up, North Carolina's in Raleigh. We stopped for the night in South Hill, Virginia just north of the border with North Carolina. Sunday was to be a driving day since we needed to reach Atlanta by day's end. We got an early start (by our standards) and headed out to Raleigh. 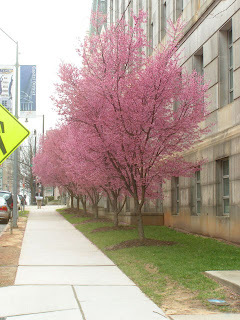 You can see the beginnings of spring in North Carolina. 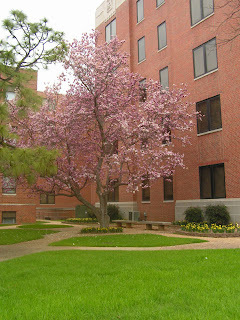 The early Dogwood trees and Magnolias are beginning to show blooms. 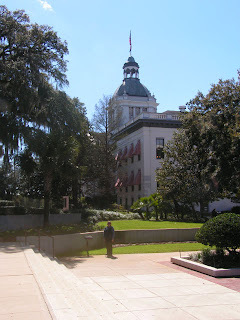 We spent a half hour or so walking the grounds around the North Carolina capitol building. 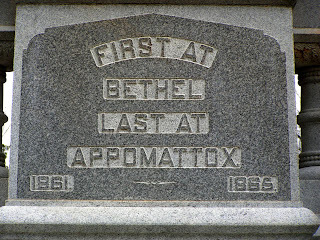 The phrase First at Bethel, Last at Appomattox refers to North Carolina's claim to the first casualty of the Civil War at Big Bethel, Virginia, Henry Wyatt, and their claim to have fired the last volley at Appomattox. After finishing up in Raleigh, we decided to look for lunch. 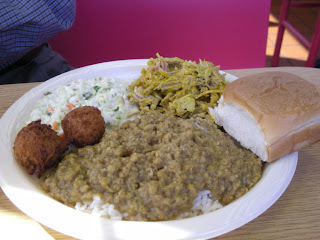 This would be our last chance for a Southern lunch so we pulled into Graham, North Carolina after noting a couple of suggestions on the billboards. We headed for Biscuitville first. 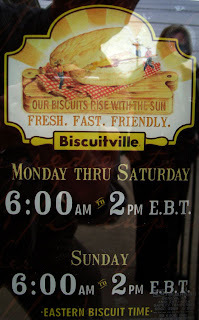 Unfortunately, it was 5 minutes before 2:00 and Biscuitville closes at 2:00p.m. Eastern Biscuit Time. Did we make it just in time? No, they had sold all their biscuits. 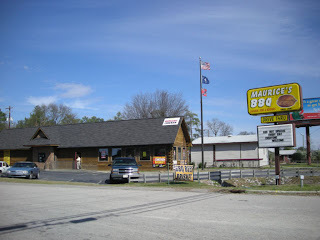 On down the road then, to B-B-Q & Ribs Co. Home of Eastern NC style barbecue, their billboard notes that they have been named to the Best of the Best list. Linda had the barbecue and pronounced it "very good." I had the Chicken and Dumplin with a side of collard greens. Yummy dumplins! We finished up with a shared banana cream pudding for desert. Locals agree that this is good Barbecue. After that it was a drive straight through to Atlanta where we stayed near the airport at a Drury, one of our favorite hotels. 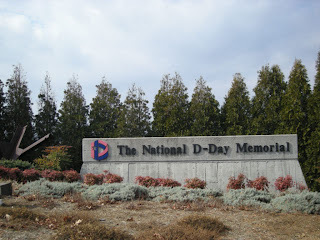 We were surprised to find the National D-Day Memorial located at Bedford,Virginia only a few miles north of Smith Mountain Lake. 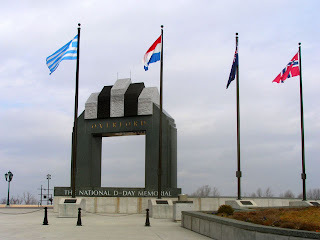 Bedford suffered the loss of 19 of its young men from a population of 3,200 on June 6, 1944 during the D-Day invasion on the beaches of Normandy. Proportionately, Bedford lost more men than any other town in the United States and as a result it was chosen as the site of this monument. Plan to spend some time here. There are 57 bronze plaques that list all of the deaths on June 6, 1944. There are separate plaques for each of the units involved. I paused a bit longer at the 1st Division plaque since I wore that division patch for several months in Vietnam. The whole site is very well done and deserves a lot more visitors. 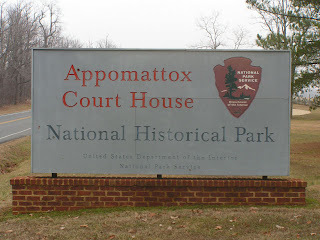 From Bedford, we moved on to Appomattox and the site of the surrender of the Army of Northern Virgina by General Robert E. Lee to General Ulysses S. Grant. I have a particular interest in this site since my great-great-grandfather, Jasper W. Sawyer was with Lee and was one of the soldiers issued a parole to guarantee safe-passage home. 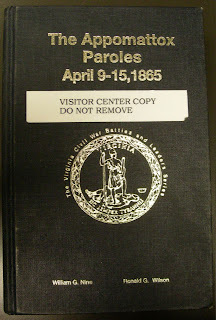 I am still looking for a copy of the original list of paroles. There were two copies. One is in the national archives and the second is in a location that I have yet to determine. I was unable to find the location of that second list while here. 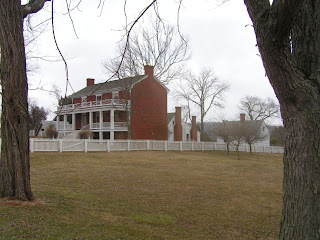 The actual site of the initial surrender meeting is the McClean House. Follow the link for an interesting discussion of the history of the property including dismantling and reconstruction. And of course, our visit to any state must include a visit to the Capitol building and a picture of one of us with the building. 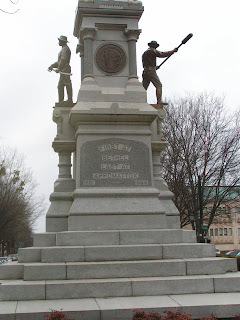 The capital of Virginia is located in Richmond, a fairly large city. The capitol building sits atop a hill with a large grounds and several interesting statues since many of the founding fathers were Virginians. It is worth noting that for most of the duration of the Civil War, this building also served as the capitol of the Confederacy. Our friends on Smith Mountain Lake showed us around the area on Friday. Besides being a scenic paradise, the lake is a great fishery for Striped, Largemouth and Smallmouth bass. 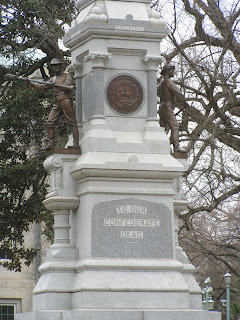 Also nearby are the birthplace of Booker T Washington and the National D-Day Monument. 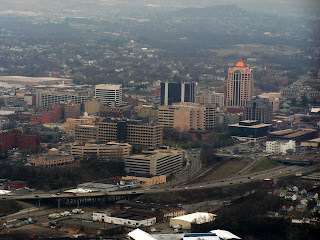 After touring the Washington site, we headed over to the city of Roanoke. 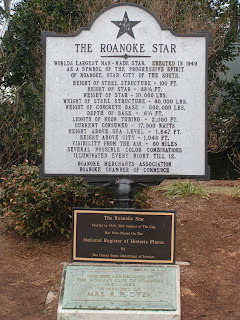 Roanoke is known as the Star City of the South. This title is due to the world's largest man-made star perched atop the steep Mill Mountain, not far from the downtown area. We drove to the top where there is a good view of the Roanoke area. 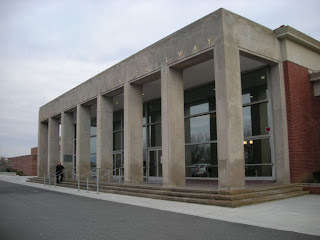 Returning to downtown, we discovered that the old Norfolk and Western passenger depot had been converted into a museum for the display of the photography of O Winston Link. A talented commercial photographer, Link created a stunning series of photographs that memorialized the end of the steam locomotive era. Highly recommended for anyone with an interest in either photography or railroading. This exhibit is very different than the exhibit of Warren McGee's on display through May of 2008 at the Montana Historical Society's Museum in Helena, MT. Link's photos are obviously and elaborately staged. He was an absolute master of lighting night time scenes. McGee's have a natural and unposed appearance. Both are fabulous. McGee's photos are hard to find in exhibit form and I hope that following May, 2008 they continue to be exhibited somewhere. Finally, we closed out the night with a dinner at Nawab Indian restaurant on Campbell Avenue in Roanoke. 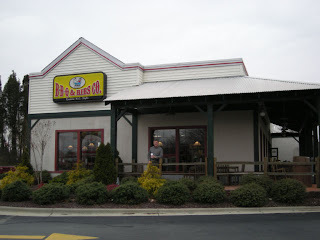 With six locations in the Virginia-North Carolina area, this small chain serves absolutely superb Indian cuisine. The Shorba-e-Murgh soup was exceptionally tasty. The Tikka Masala made with chicken had the smoothest sauce I have ever encountered for this dish. As for the service - my favorite Indian bread is poori; when I didn't find it on the menu, I asked my waiter for his suggested alternative. He replied, "I will make it for you, sir." And he did! This meal was easily the best of the trip. 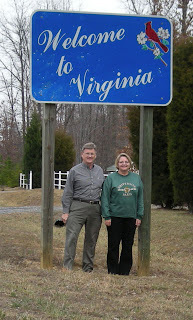 When we left Linda's sister' we were headed north to Virginia. 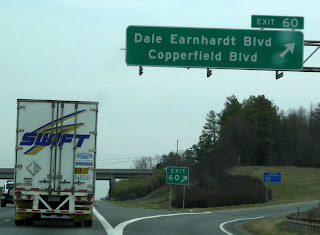 We soon passed through Kannapolis, the birthplace of Dale Earnhardt. In addition to having a street named for him in Kannapolis, this is the start of the Dale Trail. We soon arrived at the Virgina border. We were a week late for Valentine's day but Virginia is for Lovers. We had three items to accomplish here. 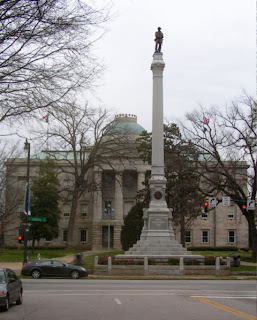 Visit friends on Smith Mountain Lake, visit the site of General Lee's surrender at Appomattox and of course, photograph the state capitol in Richmond. We found a few more interesting sites along the way. As we came farther north, the temperature dropped and the thermometer read a chilly 32 degrees as we pulled in to visit our friends on Smith Mountain Lake. We received a warm reception from our friends, though and enjoyed the visit. Sorry for adding the step of "word verification" to the comments process on this blog. A couple of days ago I posted an entry. While viewing it a couple of minutes later, I noticed a comment had been posted. Sure enough, some "bot" had trolled the site and posted a comment. If you had read the comment and followed the link you would have been led to a site that announced your computer was suffering from a virus. No doubt, if you clicked on that page's suggested solution, you would download a dandy piece of adware, spyware, malware or worse. So I now require you to key the word from one of those goofy, hard-to-read boxes in order to post your comment. And you do need a Google ID - but doesn't everyone have one of those? As my sister-in-law, Lisa, says "you live and learn!" 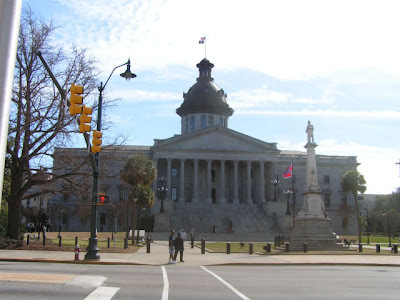 It was a short drive from St. George to Columbia, the Capitol of South Carolina. The capitol building had been the last to remove the Confederate flag. The results of the year 2000 compromise are visible in our photo. With that mission accomplished it was time for lunch. 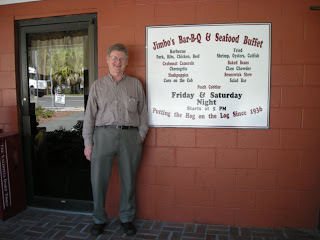 After checking out the billboards on the way into town, we settled on Maurice's Barbecue. Maurice has multiple outlets in the Columbia area. His was the first yellow barbecue sauce we had encountered. Linda pronounced it "best of the trip." The hash on rice is a real bonus! OK, I know yellow hash might not be your first thought for a delicious lunch - but this just goes too far!. 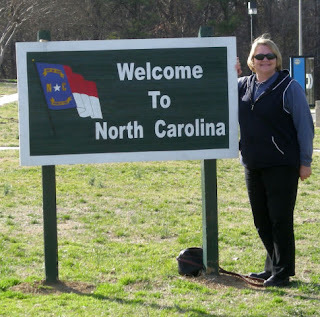 From Columbia, we headed north into North Carolina where we will visit with Linda's sister and her husband in Albemarle. 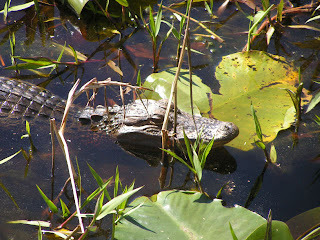 The Okefenokee Swamp is fondly remembered by many for its most famous residents, Pogo and his pals. It is a Federal Wildlife Refuge and in many ways is similar to the Boundary Waters Canoe Area before motors were banned. It is a vast area of water and swamp and while it has three roads leading into it, you really need to explore it by canoe, kayak or johnboat. 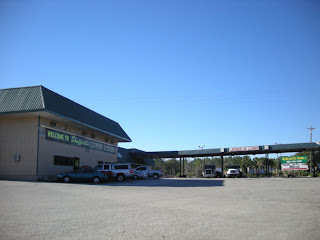 We chose the Western entrance along the Suwannee River. The swamp is the source for the Suwannee that flows westward across Florida and into the Gulf. There isn't much between I-75 and the swamp but we knew we were not going back to the Country Kitchen for breakfast. They were probably out of grits! That left us with Jasper, Florida and Fargo, Georgia. We knew Fargo had almost nothing so Jasper it would be. We passed another Department of Corrections work crew in orange vests cleaning the highway just before Jasper and pulled into town. There sat H&F Restaurant on the left side of the street. "Country Cookin" and "We Serve Buffet Style." Can't miss this! We arrived just about at the end of the breakfast hours. One of the gentlemen in a group solving the town's problems showed me where to find the coffee and we decided to have the buffet. The bacon was quite tough. The eggs and toast were cool. They did fry up some additional bacon for us - still tough though! Oh - and the grits were good if not hot. The seating is what Linda calls "Church basement style." You could choose to pull alongside someone in the long row or be standoffish. Reading the newspaper clippings about the restaurant, I could see the reason the local Jasper folks take pride in this place. It has been in business for over thirty-five years and I'd give it five stars for small-town ambiance but just one for the breakfast food. We'll give it another shot at lunchtime someday. Finally arriving at Okefenokee, we checked in at the Visitor Center and discovered that the National Parks Senior Pass works here. My Internet searches had not given us much of an idea of what to expect. 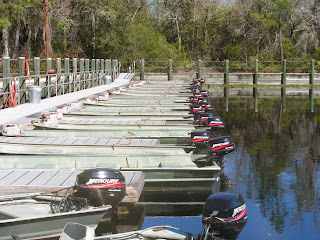 Adjacent to the visitor center, there are hour-and-a-half pontoon boat guided rides available. You can also rent a jon boat and take that out on your own. I would strongly suggest that you plan to do one of those. We didn't have the time but that would be a great way to see things. Sitting in the water close to the jon boats were a mother alligator and her baby. 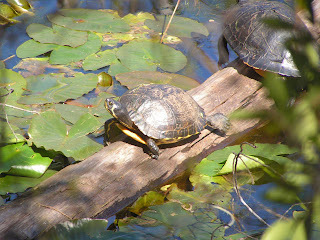 A couple of turtles were also poking their heads out of the water. 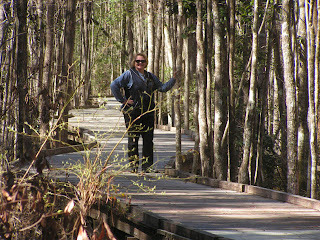 A nature trail meanders through the swamp and is beautiful. The Cypress trees, Spanish Moss and bogs are a delight. We saw two large turtles sunning themselves on a log, salamanders sunning themselves on the boardwalk and some very pretty butterflies darting among the sparse blossoms at this time of year. I'll bet that an April visit, paddling or motoring through the area is just fantastic. Following our brief tour of the swamp it was time for lunch. 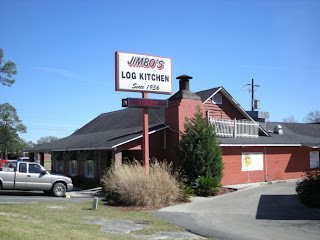 This time we pulled into Jimbo's Bar-B-Q in Homerville, Georgia. This place has been in business (or as they put it - "Puttin the hog on the log") since 1936 and the original owner's great nephew is the current owner. They serve two thousand pounds of barbecued pork each week. It was good! So good, in fact, that the local Red Hat group was lunching there also. Linda stopped and chatted briefly with them. With lunch taken care of a bit earlier today, we headed out through Waycross, Georgia and onto Interstate 95. That took us into South Carolina for the evening where we stayed in St. George. If that rings a bell with you it is probably because this is the site of the upcoming 23rd annual World Grits Festival on April 11, 12 and 13. From here we plan to head inland to photograph the South Carolina capitol building tomorrow. Monday started off with a heavy downpour and we had some heavy showers for most of the drive West to Tallahassee. We are collecting photos of all of the states' capitol buildings and hope to fill in four of our missing slots on this trip. As we approached Tallahassee, the sky cleared and we were able to take photos suitable for "The Sunshine State." 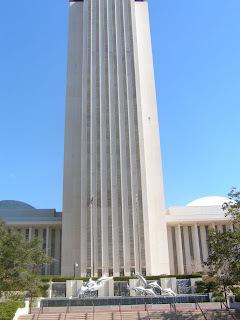 The Florida capitol is difficult to capture on film, though. There is both a traditional looking Historic Capitol Building and a current modern skyscraper behind it. With the historic building blocking the view from one side and the Florida Supreme Court building blocking the other side, I found myself wishing for Ann Althouse's new "fisheye" lens. Lacking that option, we settled for a view of the newer tower dominating the old building. With that accomplished, we began another of our famous "detours." We had eliminated traveling farther West as an option since we need to get to North Carolina and Virginia on this trip. Looking at the map, we spied the Okefenokee National Wildlife Refuge on the Georgia/Florida border. We headed up to Thomasville, Georgia so that we could find some Georgia information and take a "scenic route" to the Okefenokee. 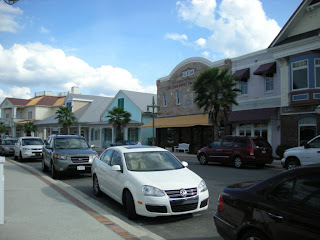 We soon found Thomasville and began following signs to the Visitor Information Center. Lots of signs and arrows - but no center! Eventually we spotted the Chamber of Commerce. They told us that the Visitor Center used to be there but moved. They were very nice and gave us lots of information in case we decide to move to Thomasville. Our main concern by this point was actually food. After conferring with the folks at the visitor center we tried to find the Market Place Diner, next to the Farmer's market. With no name on the building and no address visible we had trouble. Finally, thinking that "Early Bird Special" might just mark a restaurant, we found it. That gave us a 4:10 start on our lunch and that was definitely a "late lunch." We let the Garmin GPS take us along the route toward Fargo, GA, the gateway to Okefenokee. Miss Garmin, as we call her, has been a terrific routing assistant on our past few trips. She is getting old, though, and seems to remember restaurants that no longer exist. That had been the start of our problem in Thomasville. Perhaps a software update is in order! She took us on the back roads East to I-75 and soon had us headed back into Florida to within thirty miles of Lake City, now becoming our second home. As we pulled off the Interstate near Jasper, we decided to stop for the night. Our motel manager suggested that the food was good at the Country Kitchen just down the road. We headed out for a late dinner. As we pulled into Sheffield's County Kitchen I felt the prospects were good. There were at least five semi's parked underneath the canopy that was labeled "Jesus is Lord." As you enter the restaurant, the chapel is to the right and the food is to the left. The waitress was very cheerful as she came to take our order. Since we had a late lunch, we were ordering light. Linda asked for a chef's salad. "We're out of lettuce, sorry!" Figuring that pretty much eliminated the salad options, Linda settled for the barbecue sandwich. I ordered the six-ounce sirloin. "We're out of steaks", she laughed. Tex, with a loud voice behind me said, "This'd be a good town to open a restaurant in!" I agreed. I ordered the barbecue too. Looking ahead, I asked what kind of pies they had. "That carrot cake - that's all we have left." she said pointing to the case behind her. Actually, the barbecue sandwich was pretty good. After a couple of hours on I-75 North from Fort Myers, yesterday afternoon, we realized that we were approaching "The Villages." This interesting 55-plus community has been under development in central Florida since 1972 . 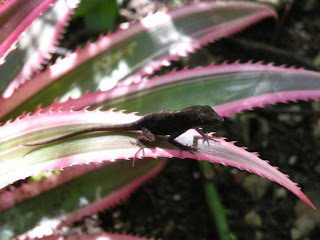 It is located about an hour's drive Northwest of Orlando. Billed as an "active" senior community, it currently contains about 35,000 homes and is building toward a total of around 50,000 or more. 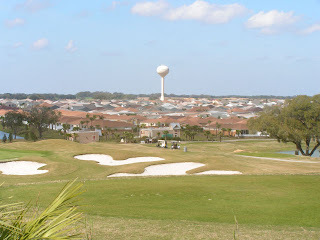 We have seen the television ads for The Villages for several years and thought, "why not stop?" We pulled into a motel nearby on Saturday night and spent several hours touring the facility on Sunday. The sales people are relatively low-key and we really enjoyed seeing three of the social centers and closed out our visit with lunch at Johnny Rocket's in one of the community villages. Lots of 1950's music playing and it looked like most of the patrons could "name that tune!" The community center and the community village looked much like a Disney project. We found ourselves much more impressed than we originally thought we would be. 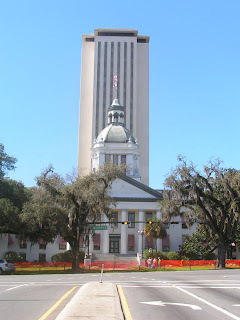 We ended the day not as far as we wanted to be on our journey to Tallahassee, site of the Florida Capitol building. In fact we only got as far as Lake City where we had stayed on our first night. We considered going into the cute little White Springs this time to stay at a Bed & Breakfast but didn't find one operating on Sunday evening. Following our trip out of the keys yesterday afternoon, we kept driving until we reached Fort Myers. This meant driving up I-75 along the Eastern edge of Florida and then taking the approximately 100 mile drive from East to West through what Floridians call "Alligator Alley." At night this drive is a real contrast to the coast since there is not a single light visible on either side of the highway. 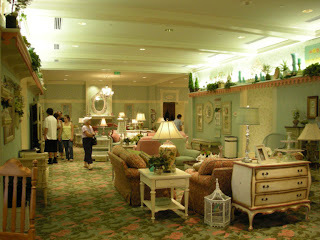 We had been invited to stay with friends in Fort Myers. 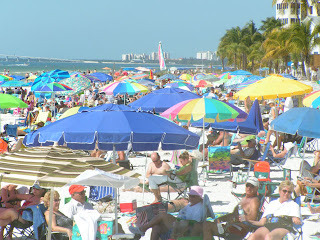 Fort Myers and the surrounding area is popular with mid-westerners for winter homes and retirement living. We ran into heavy traffic due to road repair work in the final twenty miles and didn't arrive until 11:00 p.m.
Our friends made us a delicious breakfast on Saturday and suggested a trip out to the beach. 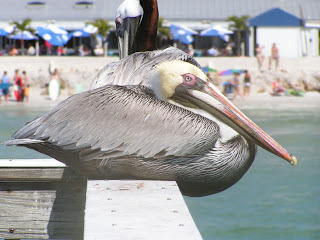 That sounded great and we were soon on the local pier watching the pelicans and people. Obviously, a lot of other people thought that the pleasant 85-degree day was cause for a beach visit too. We ended up having a very good lunch at Parrot Key Caribbean Grill along the beach. The shrimp are very good. Highly recommended! 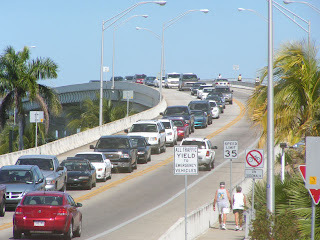 We left Fort Myers around 4:00 p.m. and headed north. We are now in Waycross, GA.
And trying to figure out why we know the name of the city. Toured the Okefenokee (bet I'll have to edit this post and fix that spelling later) swamp this morning. Will post pictures of the 'gators later. 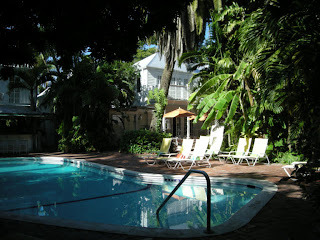 The Gardens Hotel sits on a full acre of land on Key West. They claim it is the largest single lot on the island. 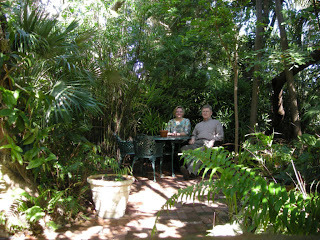 The property has only seventeen rooms and lies almost hidden amid a lush tropical garden. 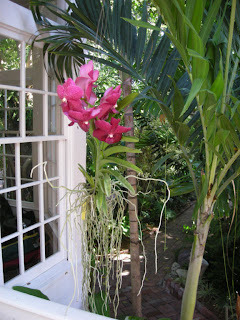 Orchids dangle near the pool and a series of trails leads through fountains and metal sculptures. 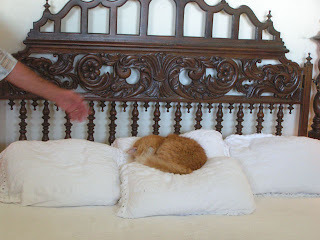 We also took the tour of the Hemingway home. 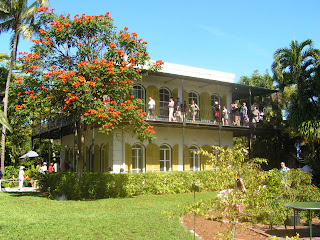 Ernest Hemingway produced about half of his published work here in the nine years that he lived in Key West. He kept his boat nearby, visited Sloppy Joe's Bar for conversation and inspiration (and for his third wife Mary while second wife, Pauline, waited at home) and adopted the six-toed cats that still inhabit the home. 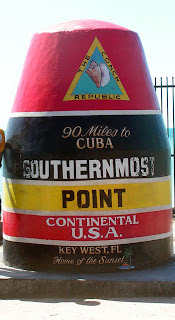 We finished the our day on the key with a trip to the Southernmost point in the continental United States and with a quick look at the nearby Southernmost House and Southernmost Hotel. 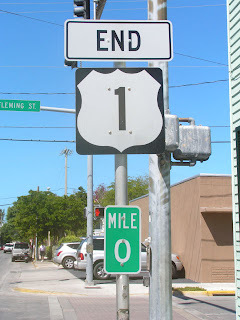 Following that, we began the trip back up U.S. 1 starting at mile marker zero. 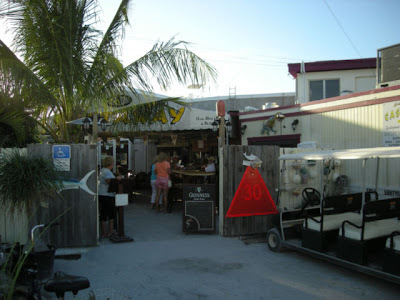 This time, we broke up the arduous journey through the keys with a late lunch at Castaway in the town of Marathon. They sell t-shirts that say "Hard to Find - but worth it" and that's a great description of the place. 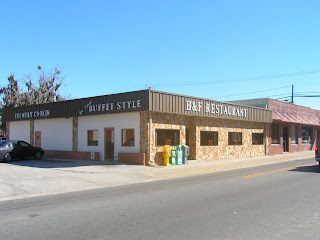 They are located at the South end of 15th street in Marathon. Try the ginger dressing! Off to the South, again!